The Kelpies almost literally bring two huge Clydesdale horse sculptures to life. Our good friend Trish guided us to Falkirk Friday to see a pair of Scottish engineering marvels. The Kelpies is a new exhibit that depicts two lake spirits as metal Clydesdale horse heads that have to be seen up close to be fully appreciated. Andy Scott of Glasgow created two 30-meter sculptures that provide nearby M9 motorway drivers with a major distraction. Kelpies come in many forms and represent spirits (Nessie!) inhabiting the waters of Scotland. 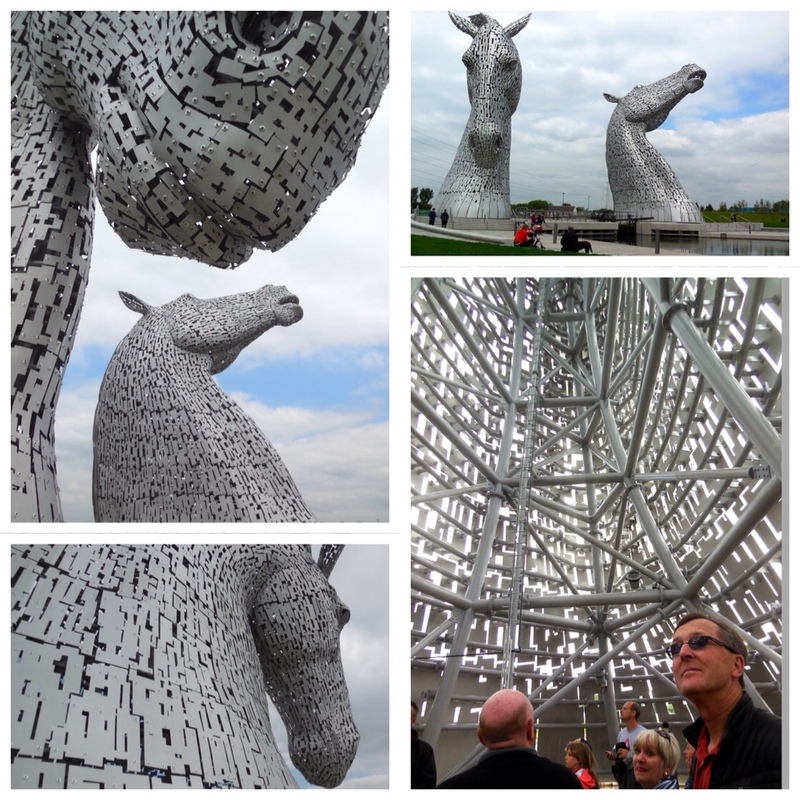 The Kelpie sculptures are the tallest horse structures in the world. 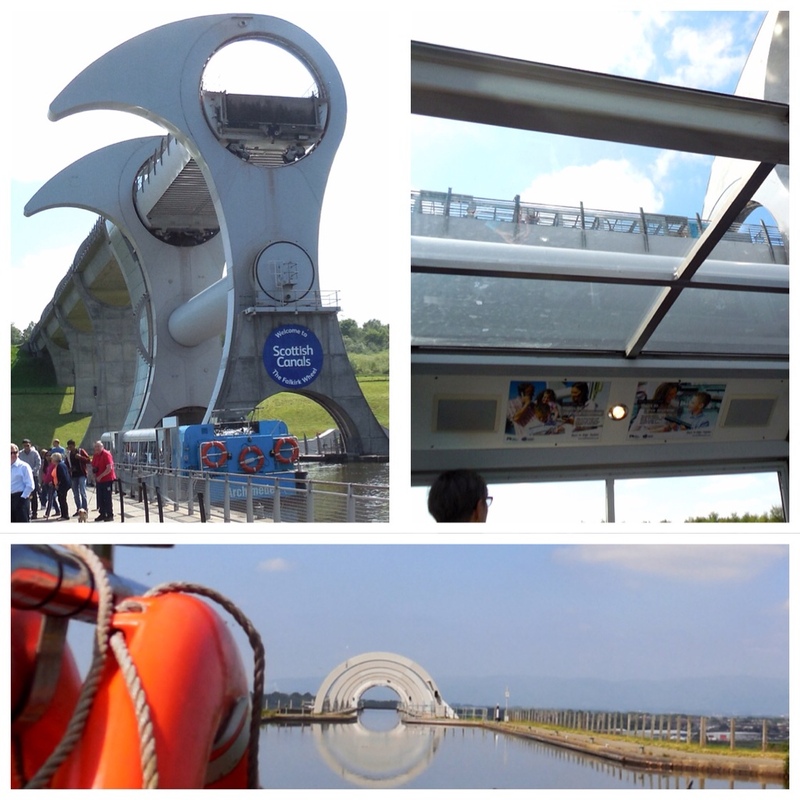 Then we ventured a few miles away to the Falkirk Wheel, a one-of-a-kind water wheel designed to connect two canals that link the waters west and east of Scotland. It hoists boats 79 feet to an aqueduct. The wheel does this with the power used to boil eight or less kettles of water. The displaced water in the upper and lower chambers is made the same, so the electric motor has to just nudge the wheel and then it turns on its own power to raise and lower the two water chambers in which the long boats float. On our way down, a touring boat joined us for the ride. In upper left photo, the boat below will be raised by the wheel 79 feet to the upper aqueduct. In upper right photo, our boat is slowly rising as the one above rotates down. The bottom photo shows the view as our boat returns to the wheel from the aqueduct to be lowered 79 feet to its original level in the canal.